•Spring hinge door closer Model K8107 passed a 250,000 cycle UL test in accordance with Underwriters Laboratories for door closers, with or without integral smoke detectors. For labeled doors 3’ x 7’ the maximum door size is based on the limits set forth by NFPA Standard #80. Labeled doors require Ball Bearing hinges. For non-labeled doors 4’0” wide 4” x 4” Spring hinges are not recommended. For non-labeled doors over 7’6” in height, use an additional hinge for each additional 30” of height or fraction thereof. All hinges are ANSI template. 4” available in square and in 1/4” & 5/8” radius round corners. 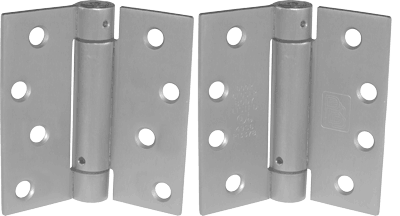 FHWS - 12 x 1-1/4"
1.For complete warranty protection use all spring hinges or a combination of spring hinges and ball bearing hinges. Do not use plain bearing hinges as this voids all factory warranties. 2.Use of gasket for smoke or sound protection, wind condition or unbalanced air pressure may prevent door from latching. Additional closing power would be required. See installation instruction sheet.